The rain beat down as our ship docked in Kauai, an island that is one of nature’s most exquisite masterpieces regardless of the weather. We were ready to see the highlights of Kauai, and we were not going to let the weather slow us down. The fourth largest (and the oldest) of the eight main Hawaiian islands, Kauai is called the Garden Isle for good reason. Lush green forests and jagged cliff edges, it is paradise, even in a drizzle. Some would say we were unlucky, as it rained on our one day in Kauai, but in reality, it is this mist that keeps the island’s vegetation growing so well. 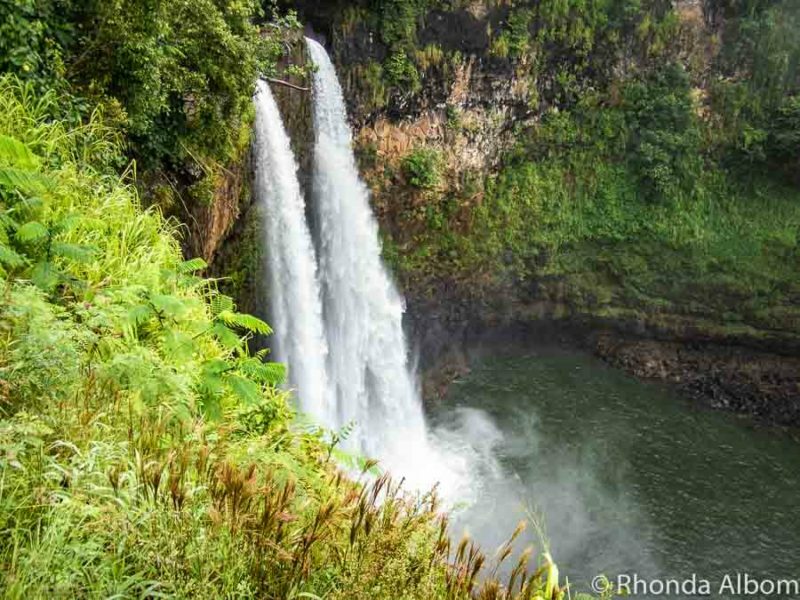 7 Which type of Kauai excursions interest you? What will be your highlights of Kauai? For us, Kauai was a cruise port as we sailed from Los Angeles, USA to Auckland, New Zealand with Princess Cruises. 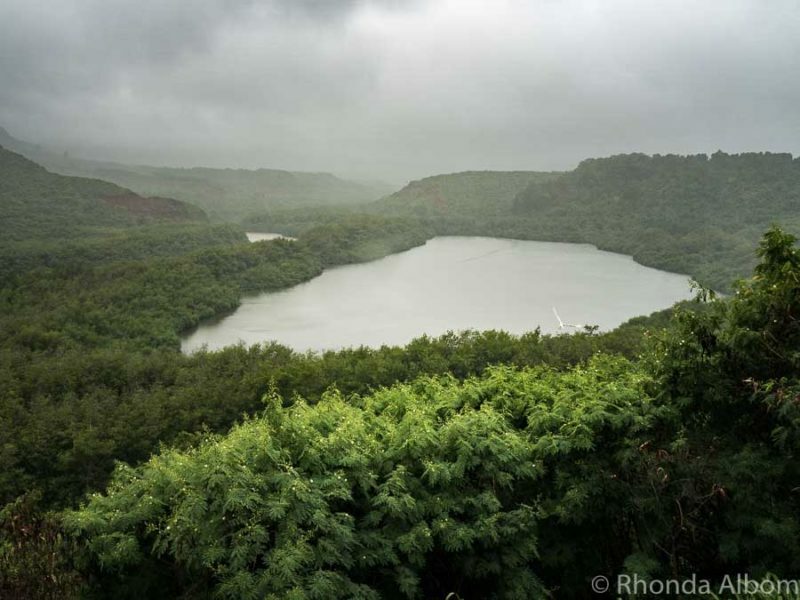 Rather than one of the ship’s Kauai excursions, we organized one on our own. We knew we had enough time to see what we wanted and make it back to the ship. (When time is tight we often opt for ship excursions). Our options included group tours, private tours, the public bus, or renting a car. We wanted the details that come from the personal knowledge that only one who lives on the island can have. We opted for a private tour so we could be flexible as the day progressed. For us, it was a great choice especially as our guide immediately recommended changes to our plan based on the weather. We rebuilt our itinerary together and off we went. 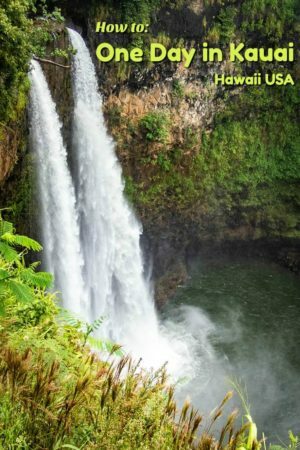 With so many wonderful things to do on Kauai, whatever you choose, you can’t go wrong. Below are some of the not to be missed highlights of Kauai. If you are from my generation, you will recognize these falls from the old television series Fantasy Island. 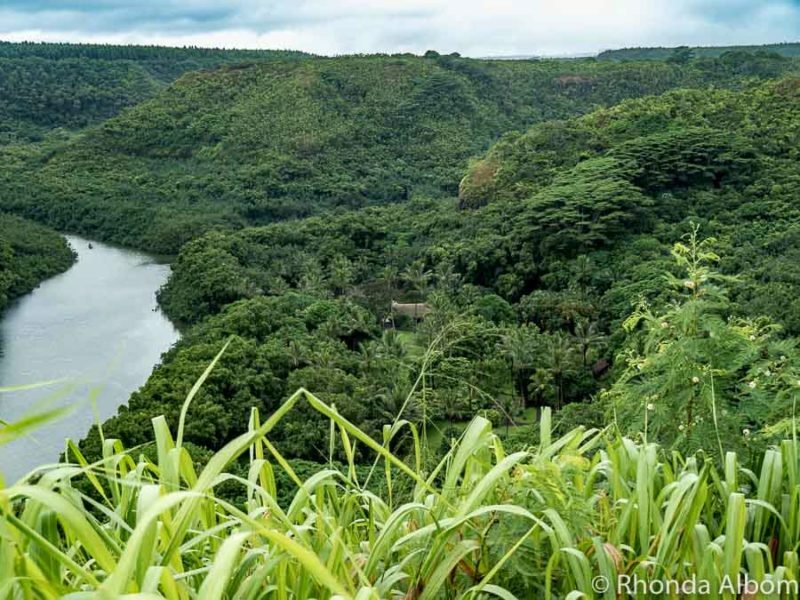 The Wailua River that they flow into is the only navigable river in the state of Hawaii. A two-mile float will bring you to a fern grotto so beautiful, it was once reserved only for Hawaiian royalty. The sound of a ‘dragon’ caught my attention before the spout reached up to the sky. It has hit heights of up to 50 feet. 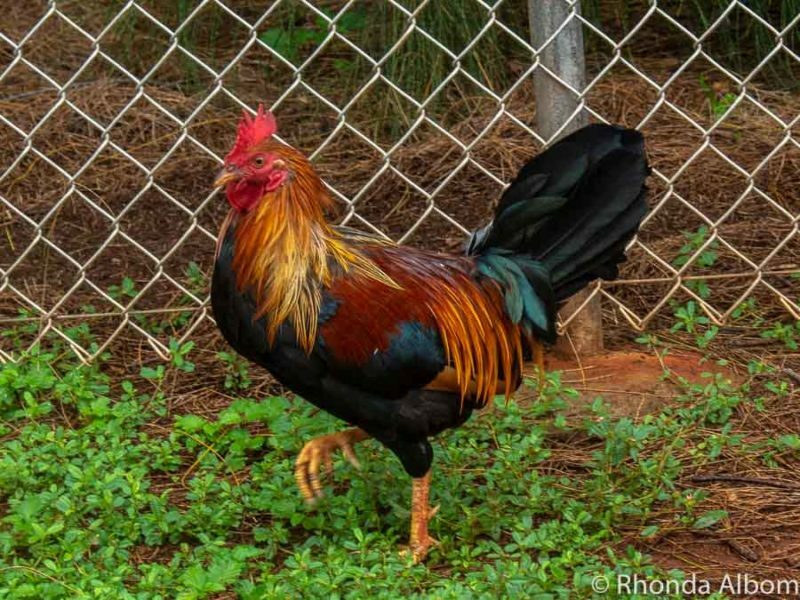 And like everywhere on the island, colourful Kauai roosters and hens are abundant in the area. I love all the colours of this rooster’s feathers. Located on the sunny south side of the island, Poipu Beach is one of the world’s top beaches and was named as the number one beach in the USA by The Travel Channel. 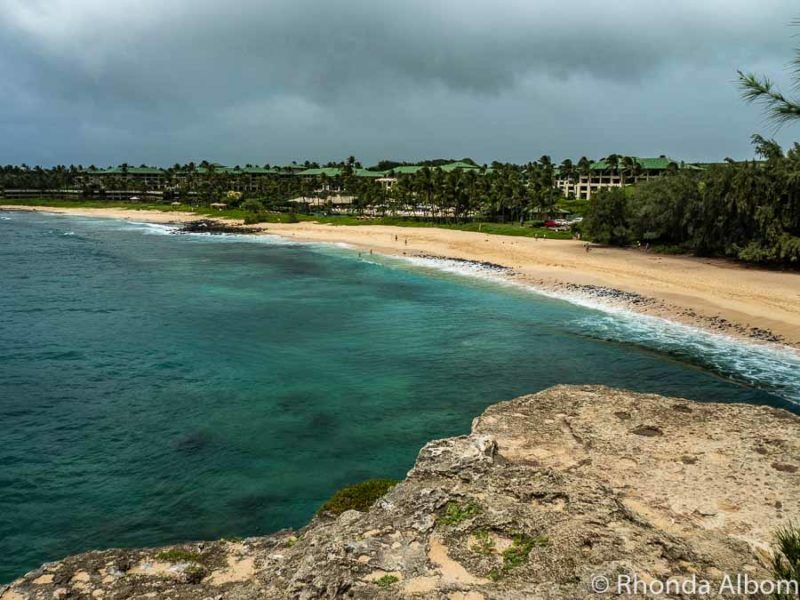 It is one of many Kauai beaches offering both a protected family swim area as well as a surf beach. In fact, nearly half of the island’s 111 miles of coastline are beaches. 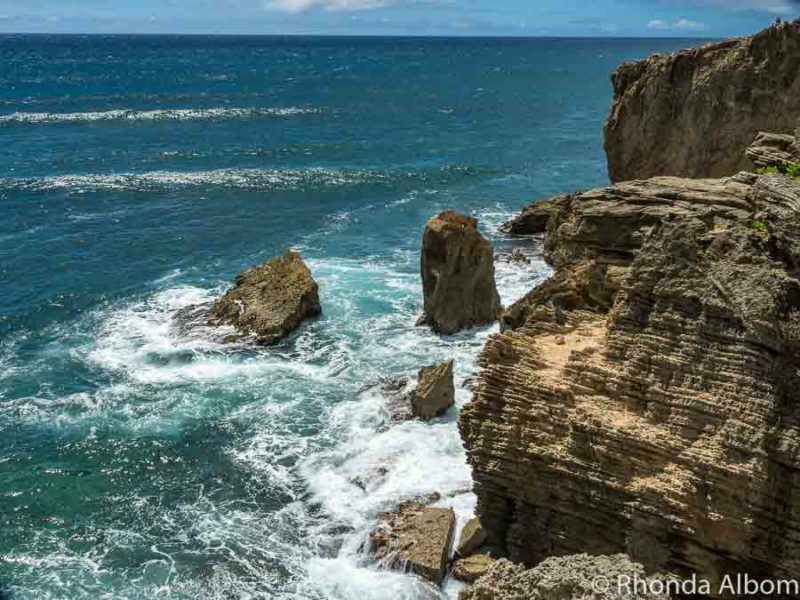 There are several fabulous Kauai hikes near Poipu. 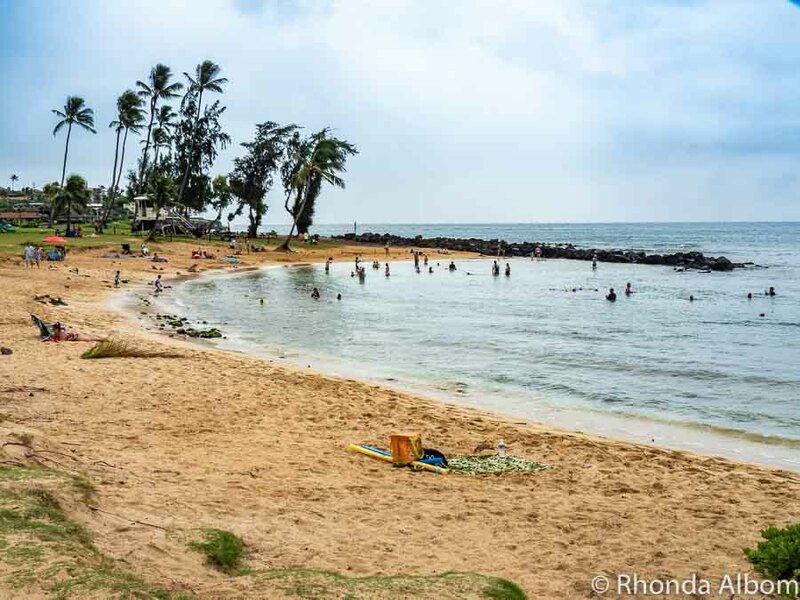 Poipu Beach is one of the world’s top beaches. If it can look this inviting in crappy weather, imagine what it must be like on a sunny day. 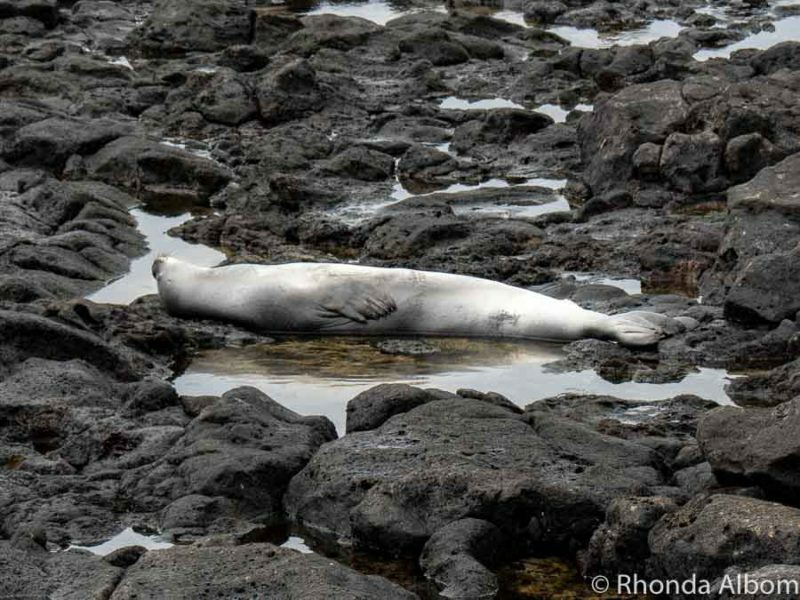 As we were driving away from here, we noticed a monk seal basking on the rocks. A monk seal on the rocks. The hike up to the top of Shipwreck Point is easy and takes only about 10 minutes. The views are well worth the minimal effort. It’s a scene recognizable from movies, like when the stars of Six Days Seven Nights were being chased by pirates and leapt off the cliff. To our surprise, a brave group of tourist followed in their footsteps. I don’t know about you, but unless I was being chased I don’t think I would jump off this cliff. However, we met a group of European tourists that felt differently about it, each one taking the leap from Shipwreck Point. The Grand Hyatt Kauai Resort viewed from Shipwreck Point. According to our guide, it was one of the filming locations of Jurassic World. One look at the image and you know why this 3,567-foot deep, 12-mile long canyon is nicknamed the ‘Grand Canyon of the Pacific.’ Waimea Canyon was originally on our list. We opted not to visit as our driver advised that with the rainy weather came heavy fog and she felt we would see nothing. Visiting Kauai is different than islands like Rarotonga, as there is no outer rim road on Kauai. 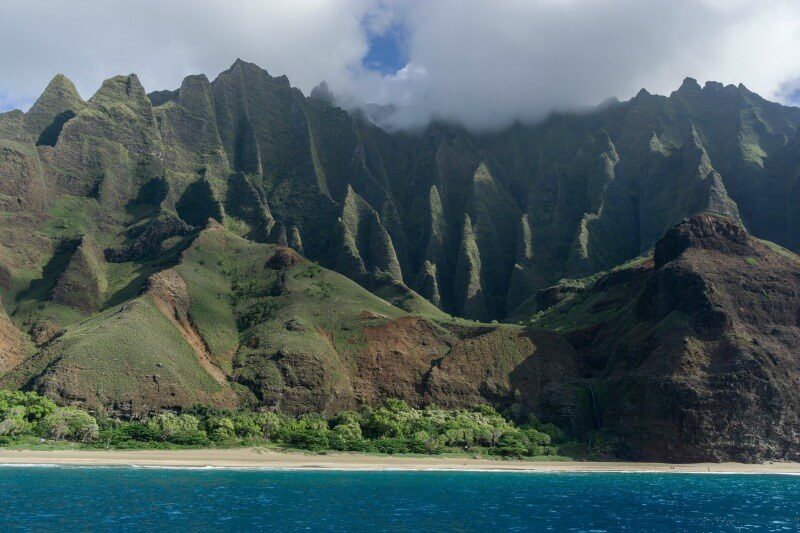 In fact, the beautiful Napali Coast can only be accessed by plane, helicopter, or boat. We didn’t get here on this visit as the weather was not favourable. It may not look it in the photo, but this 150-year old tunnel of eucalyptus trees runs for nearly a mile. It was originally planted next to sugar cane fields and offered a place for cattle to get some shade. 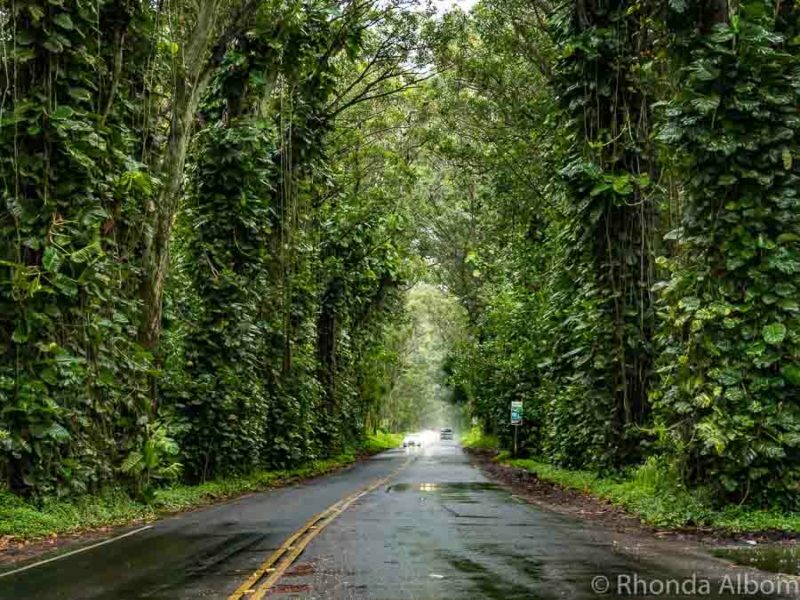 Kauai Tree Tunnel in Koloa. 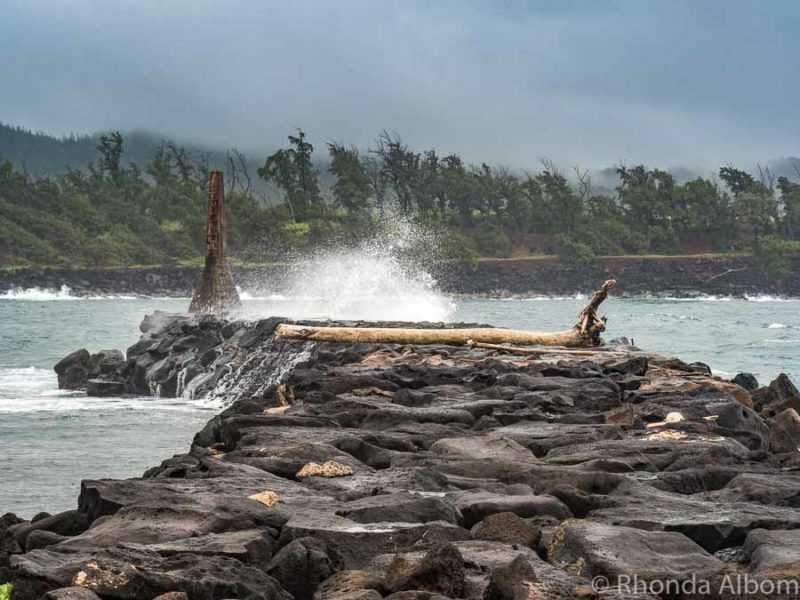 The normally massive views seen beyond the old Ahukini Harbor were limited by the fog, but along with the bad weather came the bigger waves and sea spray. 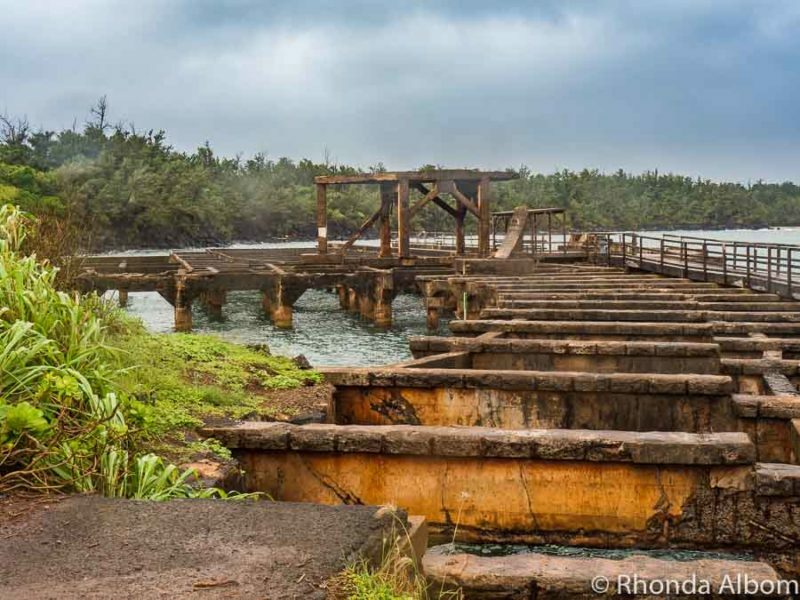 A highlight of the Ahukini Harbor are the ruins of a former train dock used by the sugarcane plantations. While sugarcane isn’t currently commercially grown on the island, it does have a long history dating back to 1835. At its peak, 70,000 acres of Kauai farmland grew sugarcane. Normally stunning distant views are seen from the old Ahukinin Harbour, but we had fog and rain. Old Ahukini harbor looks a bit mysterious on a rainy day. Viewed from a lookout point, Opeaka’a Falls is often called a rolling waterfall as the water seems to roll down rather than fall. Beautiful Opaeka’a Falls is one of the two public waterfalls on Kauai. If you visit Opaeka’a Falls, be sure to walk to the end of the path and cross the street. Here, we overlooked the camp where the movie “Outbreak” was filmed. If you allocate time, you can walk down to the village on one of the many Kauai hiking trails. The Wailua Heritage Trail leads to the village used in movie “Outbreak.” You can see the village to the right of the river. Outbreak is one of several movies filmed on the island including Blue Hawaii, Jurassic Park, Jurassic World, Six Days Seven Nights, Raiders of the Lost Ark, The Descendants, South Pacific, and Donovan’s Reef, to name a few. The once flourishing Coco Palms Resort has over 200 coconut trees on its property, and in 1961 was the filming location of Blue Hawaii starring Elvis Presley. Unfortunately, the property was damaged in 1981 by Hurricane Eva, and then more seriously impacted by Hurricane Iniki in 1992, and has been left to become derelict, a much different story than the sordid tale of the derelict Sheraton on Rarotonga. 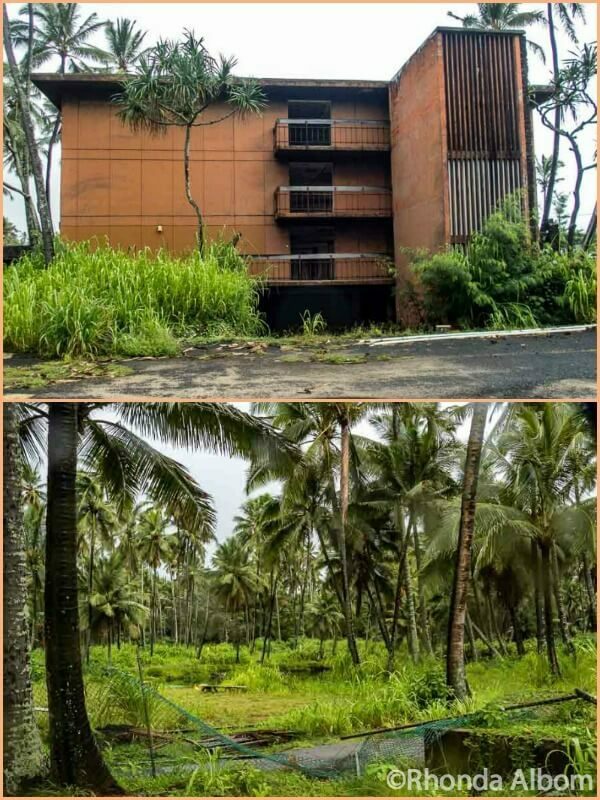 The now derelict Coco Palms Resort was once used as the filming location for Blue Hawaii starring Elvis Presley. One of the big advantages of having a private guide is the flexibility to make changes on the spot. 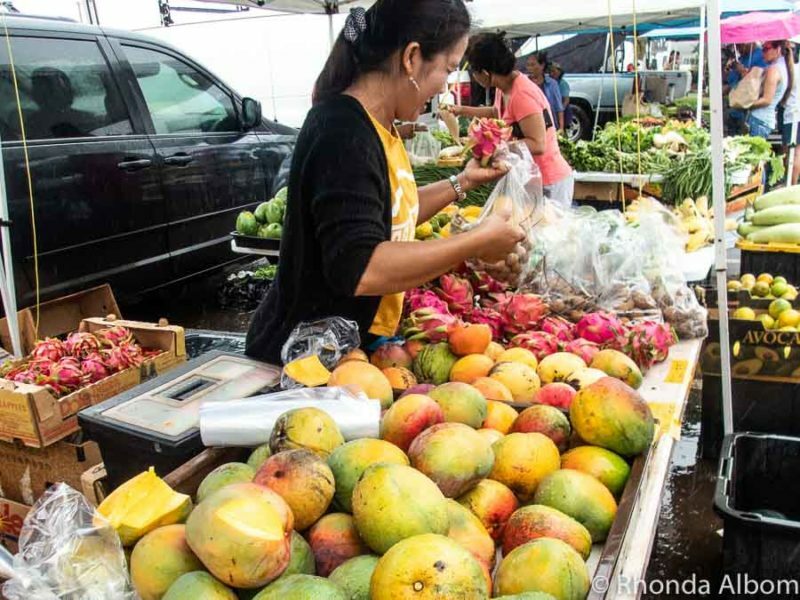 The Saturday morning farmer’s market in Lihu’e was an unplanned stop offering us samples of a variety of Hawaiin tropical fruits like Sugarloaf pineapple and Hayden papaya. We were given samples of Sugarloaf Pineapple and of one of these sweet and juicy mangoes at the Farmer’s Market. I love stopping in old historic towns like Koloa. Here we found a tiny (one room) museum that highlighted the former sugar cane industry that once dominated this area. There is also a fancy nut roastery, a coffee shop, and public restrooms. 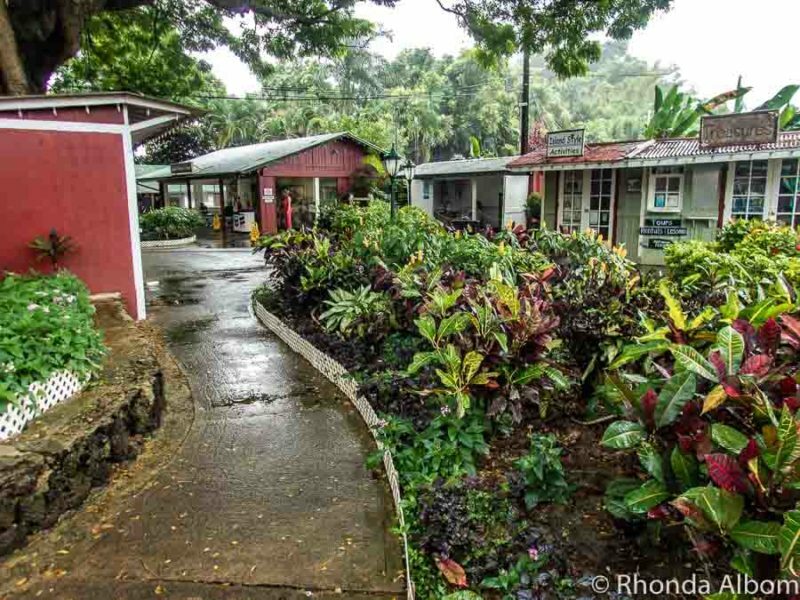 The historic village of Koloa. The Menehune are an ancient race of Kauaians, who legend tell us settled the island hundreds of years before it was discovered by Captian Cook in 1778. According to legend, they built this brick-lined fish pond in just one full-mooned night. Today, plants and pond water hide the bricks. In days gone by, the fish from the pond could only be eaten by royalty. Kauai is an easy port to visit via cruise ship, as we can walk off the ship and be in the port of Nawiliwili. For us, it was one of only five ports as we sailed from Los Angeles in the USA to Auckland in New Zealand on the Golden Princess. The other ports were Honolulu (Hawaii), Papeete, (Tahiti), Moorea (French Polynesia), and Pago Pago (American Samoa). Hawaii is part of the United States, therefore; the currency is US Dollars. However, Hawaii is the only state to have two official languages: English and Hawaiian. Driving in Kauai is like being in slow motion. While the speed limit through major towns like Lihue is only 35 mph (56 km), locals tend to drive even slower. According to our guide, it is only the tourists that seem to be in a hurry. Like the rest of the United States, tipping on Kauai is typically 15% to 20%. Hiring a taxi driver at the port to act as a tour guide will typically run $60 per hour, however; this rate is negotiable. 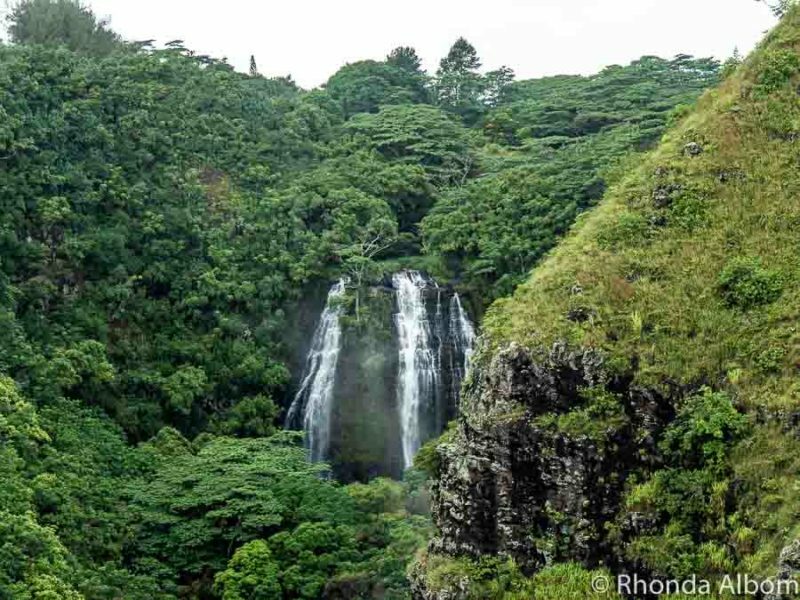 Kauai has over 300 waterfalls (up to 2,000 when it rains heavily), but most are on private land. In fact, only the two shown above are public waterfalls. It is believed that the hula originated on the island of Kauai. If you are planning to stay longer than just a Kauai excursion from a ship, there are plenty of accommodation options. We always start our search at Booking.com for great selection and prices. 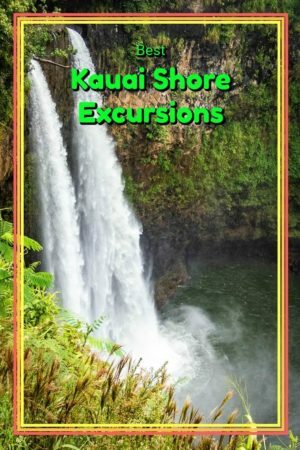 Which type of Kauai excursions interest you? What will be your highlights of Kauai? 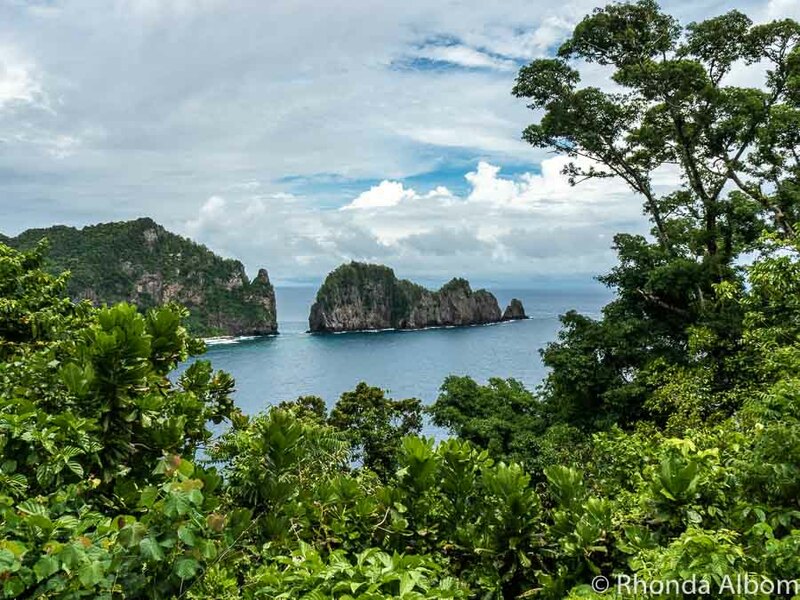 Did you feel that visiting the Islands via a cruise gave you enough time? Every time I do it I feel like i just have a taste and end up going back to the islands to explore on my own. We’ve only been to Hawaii and Oahu, never Kauai. It looks stunning, even in the rain! You definitely made the most of the your time available. We once spent a week on Kauai. We stayed in a serviced apartment a short walk from Poipu Beach. I remember seeing more than one seal basking on the rocks. We loved the place but I wish I had known more about it then. You have made me want to go back. Love this! We’ve explored about half of the Hawaiian Islands, but have not yet tackled Kauai. We’ve also been looking for a sail to Australia/New Zealand, but never thought about finding one that stops in Hawaii! That’s a fantastic idea that we will now be looking into. Thanks for the idea, and the gorgeous photos from around the island. Kauai is one of my all time favorite places I’ve been. And one can see why from the long list of things to do there. I missed alot of your list – and I was there 5 days – but the ones I did do were so wonderful. Looks like you did an incredible amount on your time on the island! Your post has perfect timing as we just talked about wanting to visit Kauai. We’ve been to the Hawaiian Islands a few times, but never Kauai, which I hear is the most lush and beautiful of the islands… though I suppose that’s because it’s also known for being the rainiest. So many highlights! I personally would love to see (and hear!) 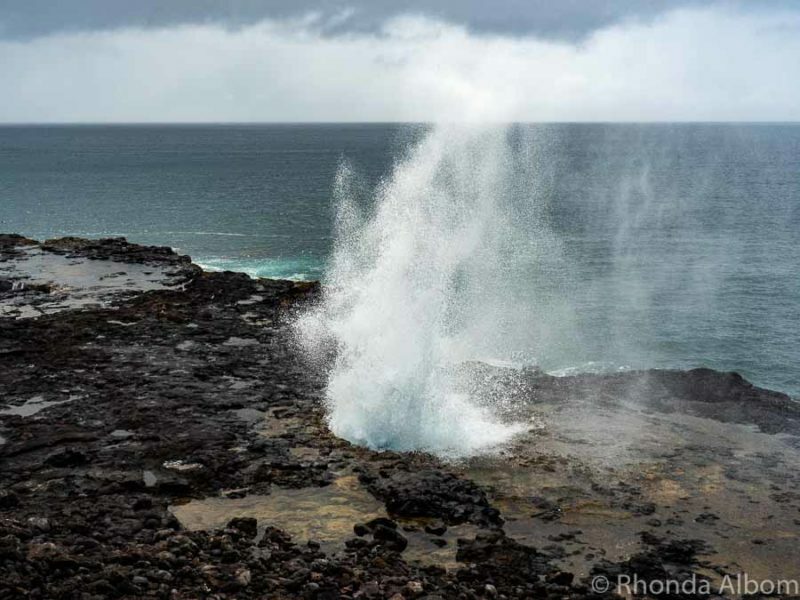 the Spouting Horn, see the beautiful Napali Coast, and visit the Tree Tunnel. When I visited Hawaii years ago, I didn’t make it out to Kauai, but you’ve given me many reasons to go! Kauai is my favorite of all the Hawaiian Islands. We’ve been there so many times, but I can never get bored of it. Was this your first time in Kauai Rhonda? I hope not, because if it was and you got rained on it’s really sad. Usually the rain goes away pretty fast at the tropics, but I’ve been in Kauai one time when it every single day for a week. The only spot on the island where it was sunny was the South Shore, at Poipu Beach. So we had to drive down there every day for a week, to see the sun. I was there for a week a long time ago and it was fantastic. All I can say Rhonda is fantastic. I hope to take my wife on a cruise to Hawaii in the future. Sooner them later. See ya. I remember Fantasy Island. Da plane, da plane That we Herve but unfortunately he died and so did Mr. Rourke. See ya Rhonda. Oh, the waterfalls and rugged hills look absolutely amazing. What an amazing place, this is so inspiring!! Next time I am in Hawaii I want to go to Kauai! It looks gorgeous and there is so much to do. I would have a hard time deciding what to do if I only had one day. Your blog post took me back to my visit to Kauai years ago. 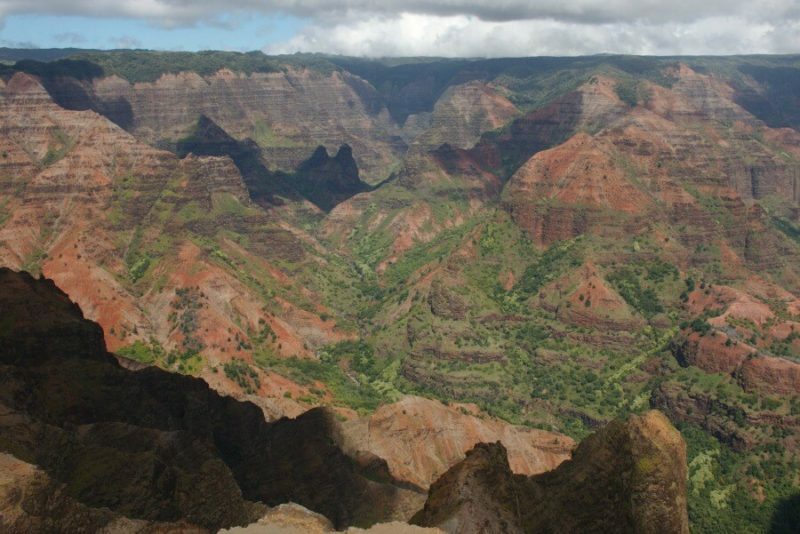 It’s impressive to see that the same spectacular landscapes of Waimea Canyon. Thanks for sparking some great memories with your gorgeous photos! Hawaii is still on my Bucket List and your photos just made me want to go even more! The water fall looks especially amazing! Beautiful, even in the poor weather you had. My favorite photo is the waterfall. I have a feeling that would be my favorite place on Kauai too! I really enjoyed Shipwreck Point and the people jumping off the cliff. It was a thrill to watch. We were in Hawaii last April, visiting Maui, Oahu and the Big Island. It was an unforgettable adventure and we’re already planning on returning to visit the other islands. Kauai’s on top of our list this time. Can’t believe how much you got to see in just a day. Taking a private tour was clearly the right decision… and so was not jumping of that cliff. I prefer a private tour so I can see what I want to see and when I want to see it. No waiting and customized to my tastes. I would really like to go to Kauai or any of the Hawaiian islands. But I feel like I will need months to see everything! Maybe I should just move there, lol. Also, it’s really cool that you saw a monk seal! I’d love to see one in the wild. I would have loved to see more but I figure I can go back there someday. The same thing happened to us with the weather when we were doing a snorkelling tour off Maui. It was pouring with rain when we arrived and as we sailed out, but by the end of the day it was beautiful and sunny. Hawaii is just such a gorgeous place! I don’t think snorkelling in the rain would bother me as long as there was enough light. I am from California and Hawaii was always a quick and inexpensive escape as there were always deals to be had. There is nothing like Hawaii. I really miss it. Kauai is also my favorite island and I have 2 good friends who live there. I am craving some Hawaii now. Thanks for taking me back and reminding me of the wonders of the USA. You are very lucky to have easy access to such a beautiful island. I would have liked to spend a bit more time than one day there. I think I was lucky in that it only drizzled a little bit when I was outside. How beautiful! That waterfall is stunning. The basking seal made me laugh out loud! I was impressed by the height of the waterfall. I saw two monk seals – this one and one at the aquarium on Oahu. Oh you are making me nostalgic! We love Kauai! So glad you explored on your own – what a beautiful island. We have stayed on the Poipu side a couple times and just loved it. And the Waimea Canyon is just epic. One more movie filmed on Kauai for your list – the 1950’s classic South Pacific was filmed at Hanalei Bay on the North shore of Kauai as well. And I can HIGHLY recommend the fresh tuna poké from the Koloa Fish Market there in Koloa town. YUM. Salivating just thinking about it! Fab post – cheers from Copenhagen! There were so many movies made on Kauai. The island is absolutely stunning. I’m a traveler myself and these are some amazing destinations. Mountains and waterfall have always been my love, sadly I’ve never been to a beach yet. That menhune fishpond though is the ultimate dream of an explorer from a bird’s eye. Lovely post, thanks for sharing all these. Will add them to my go-to list. I love it all, mountains, waterfalls, and the beach. I just like exploring new destinations. Apparently, monk seals are a rare find. First off, I’ve always heard such great things about Kauai! You’re so lucky to have gone there! Second, Wailua Falls looks incredible! I would go just to visit it! I agree. The Wailua Falls are spectacular. Apparently, it used to be very common to hike to the base, but parking is very limited in the area and people would get a spot and then hike. Now parking is maximum 20 minutes and enforced. Yes, each island we have been to in the Pacific seem to be distinctively different from the others. Kauai is in the Northern Hemisphere, and quite a bit built up, yet still lush. So beautiful! We are going to Oahu at Christmas! Our cruise took us to Oahu the day before Kauai. We stayed mostly close to Honolulu, so for us, the two visits were completely different. Wow, that tunnel of trees is so long, but my favourite spot on Kauai is Napali Coast. Too bad you didn’t get to go there. I love tree tunnels also, and this was by far the longest one we have ever seen. WOW! What a fantastic thorough post of the fantastic setting of Kauai – I just loved how you really got a sense of the island through your fabulous pictures and itinerary. I absolutely am adding this beautiful island to the top of my travel bucket list, but I can’t promise that I would jump off that cliff. LOL! Thank you so much for sharing and I’m pinning for future reference. Thanks, Ana, it is such a lovely island. I hope you can go for a while so a rainy day would impact you less. And, cliff jumping is optional. In fact, our guide said she had never seen tourist do it before that day. Ah!!! Loved all of your recommendations and photos! I have been wanting to go to Kauai! My husband and I recently got married in Oahu, and we are now wanting to go to Kauai! Love all the waterfalls and greenery! Hawaii would be such a beautiful place to get married. Kauai seems like the perfect anniversary celebration. We are looking at taking a Hawaii cruise next year. I think I am braver than you. I want to jump off that cliff. LOL – If you can look at it and think it would be fun, you are way braver than me. 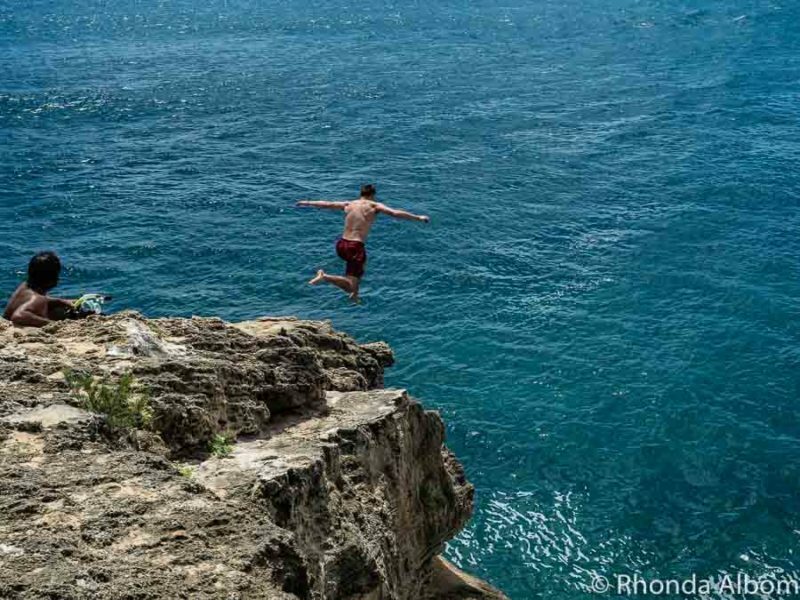 Whenever I see people jumping off cliff I keep thinking how liberating it must feel! But at the same time I don’t think I could ever do it! lol I love visiting farmer’s markets whenever I travel. I don’t think I could feel anything other than terror if I jumped off a cliff. Pretty! Impressive that it looks this nice in the rain. I have to admit, I was a bit worried when I saw the weather, but it turned out to be a colourful day despite the rain. I have only been to the Big Island, but I see I really missed out by not visiting Kauai. We were on the Big Island years ago. It is also lovely, but very different. Kauai is very lush. Incredibly gorgeous sights on Kauai Rhonda. Way cool seeing the monk seal too. I reckon these guys do not show up much in Hawaii, preferring cooler climates. What eye-popping images. Thanks Ryan. I hadn’t realized how rare the monk seal sighting was, but I am starting too. It’s amazing the diversity on just one island. I wouldn’t jump from that cliff either. Actually, I’d be pressed to get into the ocean at all. I know the Jaws theme song would play the entire time. The first two excursions on the list sound my style. My hubby is the same way about the ocean and the movie Jaws. My favorite of all the Hawaiian Islands. I love Kauai and there is so much to do. I have only been to four of the islands, but Kauai is my favourite so far. We had a great time on Kauai – I loved the canyon and we sailed the Napali Coast. Just magnificent. So pretty. Lucky you seeing the monk seal. We saw one on the beach on the North Shore on our 3rd day and our friend who lived in Hawaii for 4 years and surfed most days had NEVER seen one! Apparently it’s rare, according to him???? Our guide was extremely good at spotting the monk seals (plus I used to work at a marine animal rescue centre) so we were looking for them. I didn’t realize it was a rare spotting.